We now have some firm Xbox Scorpio specs via Eurogamer's Digital Foundry, so how does it stack up against Sony's PS4 Pro? Let's take a look at some of the key points raised side by side, namely specs, price, 4K output and basic, grunting raw power. Here are the spec for Scorpio and Pro, or at least the ones we can compare directly. Digital Foundry makes an estimate of a £400/$499 price for Scorpio. That's based on the PS4 Pro's £349/$399 starting price and then factoring in extra memory, faster hard drive and a "state-of-the-art cooling solution." According to the report PS4 Pro has been clever with "checkerboarding, advanced anti-aliasing techniques, temporal super-sampling and dynamic resolution" to make sub-4K outputs look okay, without being true ultra HD. However, the Pro has mainly favoured mainly 1440p, with a few 2160p outputs. Microsoft has very firmly stuck it's flag in full 4K, though, and Digital Foundry says "if we take Microsoft's statements at face value, there's no reason why all titles that run at 1080p on Xbox One shouldn't run at native 4K." The PS4 Pro run at 4.2 teraflops compared to the base PS4's 1.2. Digital Foundry stats that the Scorpio "does achieve Microsoft's stated six-teraflop performance figure" so it's a more powerful console in terms of horsepower. Apparently it does it in a slightly different way to the "slower but wider GPU" that was predicted. Instead it pushed clockspeeds "closer to desktop GPU counterpoints." 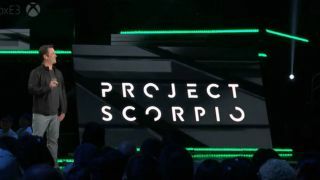 The report suggests those six teraflops with go much further than the same power in a PC due to various software and hardware optimisations.